This book was in my to-be-read pile since I got the ARC but I never got the time or mood to read this. There's something about it that makes me think twice whether to read it or not. I was thinking it will be like Eleanor and Park by Rainbow Rowell or Say What You Will by Cammie McGovern and to be honest the feelings while reading this was the same one when I was reading the books I have mentioned above, and that's a good thing because I enjoyed it. I was so ready to finish it in one day but I was sad because I have to do something else like house chores and work in the office so finishing it got really delayed that's why half of the book was finished yesterday, June 21. The story flow was a pretty one. I always imagine myself to be in a body of a guy and to feel what they feel because I always wanted to be a guy but it won't ever happen I know so for a minute I considered Ellie a lucky character because she was able to swap body to a guy and not just a guy but a popular guy! This book is full of awesomeness because each turn of the page? Either you will laugh, smile, get pissed off or learn something from each individual lives. This type of book are the ones you will hardly put down. All you wanted is to read until you reach THE END yet, when you did you'll probably ask for more. The cover of the book is also catchy and so with the title. I got curious the first time I saw it. I suddenly remember Every Day at this book. Living in somebody else's body? well have you imagined now how this one looks? I think people who will read this will enjoy everything. This is such an easy read but fantastic book that you will fall in love with. "Sometimes we miss people, and it's beyond words." Born and raised in Ithaca, New York, Megan Shull is the author of THE SWAP and several books for kids including the award-winning young adult novel Amazing Grace. Megan holds a doctorate in educational psychology from Cornell University, where she also earned her undergraduate degree. She lives in her hometown, where she feels especially lucky to walk the quiet rolling hills alongside red-tailed hawks and waterfalls. 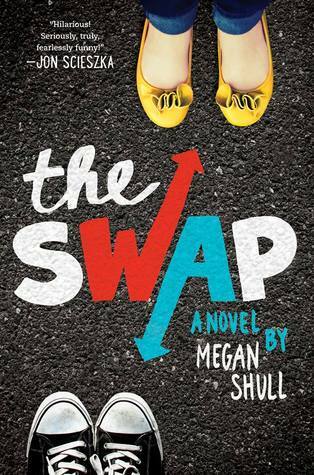 Megan Shull's new novel, The Swap, is available NOW from HarperCollins.